Friendship is one of the best aspects of life. True friends are there for you when all is well and especially when it's not. Dogs are generally considered man's best friend, but it turns out that they can be friends with multiple other species and not just humans. Like people, canines understand how valuable friends are in daily life. The following videos are proof of how dogs view many other animals as their best buddies. Whether you smile, oink, bark, meow, or quack, a dog will accept you completely as you are. Watch these clips and brighten up your day! 1. Can you tell that these dogs are happy to see their friends? Here are three loving dogs who are overwhelmed with happiness to see their best four-footed friend and his two-footed owner at the door. In fact, the dogs are so excited that these friends have arrived that the guests can't get in the door! Watch the love fest in the clip below. 2. These two friends are proof that love conquers all. When Pip the deer's mother was frightened off, she abandoned her baby fawn. Thankfully, Kate the Great Dane stepped in as a foster mom and dog and deer became inseparable. Watch their incredible story in the following video. 3. It's the doggie version of a trust fall. This Border Collie mix must have his friends' utmost trust because they don't make a move while lying on the ground as he hops over them. Check out this fantastic video below! 4. This video features tons of furry fun! Think that a dog roughhousing with a ferret gives the dog an unfair size advantage? Not if the dog is Buckley who treats his best ferret friend Magneto with the utmost gentleness and care. They still have a good time play wrestling, though, as you can see in the following clip. 5. Dogs make great big brothers, too. Not only is Fritz young Gatsby's best canine friend, but he's Gatsby's mentor as well. It's up to Fritz to show Gatsby all the essential things that dogs need to know, like how to catch. Or maybe not...just watch the video and you'll see what I mean! 6. If you can't out-cute them, then join them. A family took in and cared for some ducklings, and their Doberman was just as overcome with their cuteness as everyone else. So he decided to join them in the tub for their evening bath. Get ready for some cuteness overload in this clip! 7. These best friends have each other's back even during nap time. 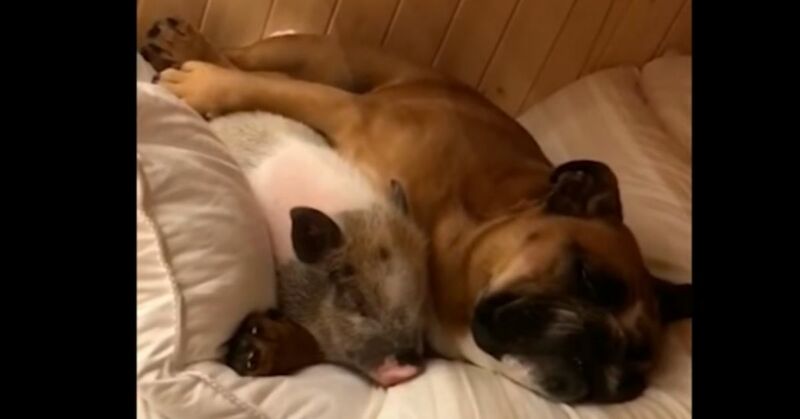 Here is a delightful video of a dog snuggling with his friend, a pig. These two friends are as cute as can be, super comfortable, and entirely relaxed. Sounds like a great plan! Watch this beautiful video and share the love.